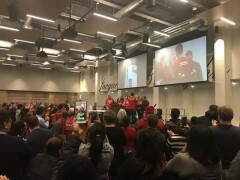 Chicago charter school strikers win major victory | Fight Back! Chicago, IL - The 500 striking Chicago Teachers Union (CTU) members at 15 UNO/Acero charter schools won a major victory in the early morning of December 9, when a tentative agreement was reached. CTU educators at UNO/Acero schools have been on strike since Tuesday, December 4, and have held the picket lines at their schools with parents and other supporters. The strike was the first of a charter operator in the nation.